Although crows and ravens are part of the same family (Corvus), they’re not exactly the same bird. Typically, ravens are quite a bit bigger than crows, and they tend to be a bit shaggier looking. The raven actually has more in common with hawks and other predatory birds than the standard, smaller-sized crow. In addition, although both birds have an impressive repertoire of calls and noises they make, the raven’s call is usually a bit deeper and more guttural sounding than that of the crow. Both crows and ravens have appeared in a number of different mythologies throughout the ages. In some cases, these black-feathered birds are considered an omen of bad tidings, but in others, they may represent a message from the Divine. 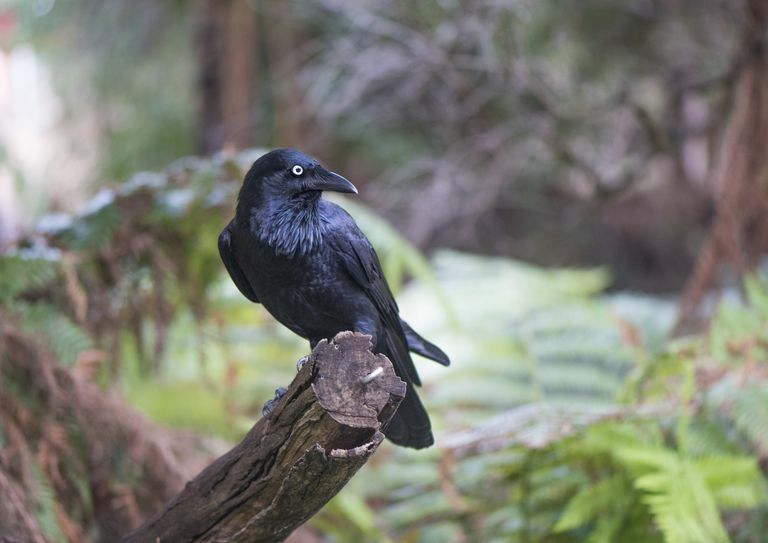 Here are some fascinating crow and raven folklore to ponder. In Celtic mythology, the warrior goddess known as the Morrighan often appears in the form of a crow or raven or is seen accompanied by a group of them. Typically, these birds appear in groups of three, and they are seen as a sign that the Morrighan is watching -- or possibly getting ready to pay someone a visit. In some tales of the Welsh myth cycle, the Mabinogion, the raven is a harbinger of death. Witches and sorcerers were believed to have the ability to transform themselves into ravens and fly away, thus enabling them to evade capture. The Native Americans often saw the raven as a trickster, much like Coyote. There are a number of tales regarding the mischief of Raven, who is sometimes seen as a symbol of transformation. In the legends of various tribes, Raven is typically associated with everything from the creation of the world to the gift of sunlight to mankind. Some tribes knew the raven as a stealer of souls. Native-Languages.org says, "In Native American folklore, the intelligence of crows is usually portrayed as their most important feature. In some tribes, the crow is conflated with the raven, a larger cousin of the crow that shares many of the same characteristics. In other tribes, Crow and Raven are distinct mythological characters. Crows are also used as clan animals in some Native American cultures. Tribes with Crow Clans include the Chippewa (whose Crow Clan and its totem are called Aandeg), the Hopi (whose Crow Clan is called Angwusngyam or Ungwish-wungwa), the Menominee, the Caddo, the Tlingit, and the Pueblo tribes of New Mexico." For those who follow the Norse pantheon, Odin is often represented by the raven -- usually a pair of them. Early artwork depicts him as being accompanied by two blackbirds, who are described in the Eddas as Huginn and Muinnin. Their names translate to “thought” and “memory”, and their job is to serve as Odin’s spies, bringing him news each night from the land of men. Crows sometimes appear as a method of divination. For the ancient Greeks, the crow was a symbol of Apollo in his role as god of prophecy. Augury -- divination using birds -- was popular among both the Greeks and the Romans, and augurs interpreted messages based on not only the color of a bird but the direction from which it flew. A crow flying in from the east or south was considered favorable. In parts of the Appalachian mountains, a low-flying group of crows means that illness is coming -- but if a crow flies over a house and calls three times, that means an impending death in the family. If the crows call in the morning before the other birds get a chance to sing, it’s going to rain. Despite their role as messengers of doom and gloom, it’s bad luck to kill a crow. If you accidentally do so, you’re supposed to bury it -- and be sure to wear black when you do! In some places, it's not the sighting of a crow or raven itself, but the number that you see which is important. Mike Cahill at Creepy Basement says, "Seeing just a single crow is considered an omen of bad luck. Finding two crows, however, means good luck. (Three crows mean health, and four crows mean wealth.) Yet spotting five crows means sickness is coming, and witnessing six crows means death is nearby." Even within the Christian religion, ravens hold a special significance. While they are referred to as “unclean” within the Bible, Genesis tells us that after the flood waters receded, the raven was the first bird Noah sent out from the ark to find land. Also, in the Hebrew Talmud, ravens are credited with teaching mankind how to deal with death; when Cain slew Abel, a raven showed Adam and Eve how to bury the body, because they had never done so before.